Syrian Villagers Hope Their Example Will Be A Model Rebels recently took control of the Syrian border village of Khirbet al-Joz. Since then, the villagers have selected a town leadership. They also have a police force chosen by the town rather than the regime. They hope their model will be widely emulated. 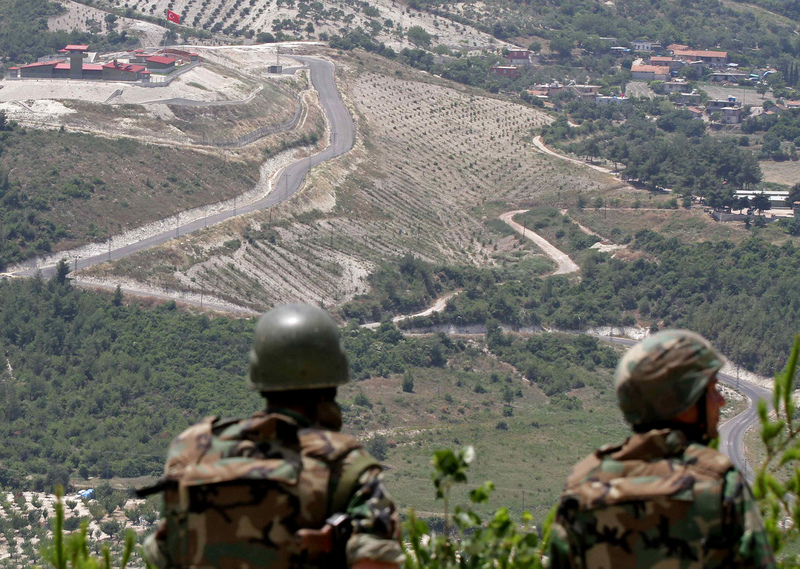 In this June 2011 photo, Syrian soldiers look down on the village of Khirbet al-Joz, on the border with Turkey. Syrian rebels recently captured the village, and residents are setting up a secular, democratic leadership they hope will serve as a model. As part of an advance by Syrian rebels, they captured a village this fall near the northern border with Turkey called Khirbat al-Joz. Syrian families who had fled to Turkish refugee camps returned to see what had happened to their homes and farms. Many found charred ruins — a village devastated by war. Now, the villagers are rebuilding. And with the help of Syrian activists, they are trying to set a small example of a secular, democratic place. It's a cold and rainy day, but that doesn't dampen the celebration at the police station when Syrian activist Razan Shalab Alsham arrives with 20 brand-new police uniforms. She's part of a group called the Syrian Emergency Task Force that raised money for the project. These are local men who joined rebel brigades to free their village from the control of President Bashar Assad's regime. Now, they say, they want to be a civilian police force to back the civil council that runs things here. 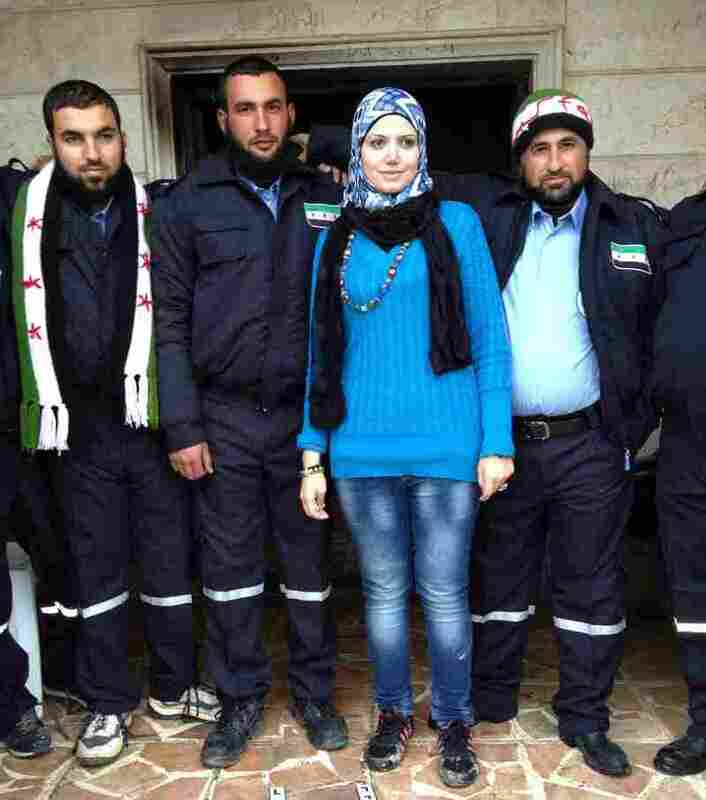 Razan Shalab Alsham, in bright blue, works for the Syrian Emergency Task Force. She helped provide uniforms for the new civil police force of Khirbet al-Joz. For the first time, Khirbat al-Joz is run by local residents, not leaders appointed by the central government in Damascus. The blue uniforms are a symbol of the change, says Shalab Alsham. "The most important thing is he will change [from a] military uniform to a civil police uniform. This is the most important thing," Shalab Alsham says. The men pull on the trousers, zip up the jackets and spill out of the police station. They shout, "God is greatest." But they are secular-minded men who shake hands with female visitors and pose for pictures when they are all dressed in blue. Ahmed Fido, an army officer who defected, is now the chief of police. He is asked how the new uniforms will change things here. "It is very important because the civilian people should show that they are civilian," Fido says. "Police and life should be normal again without the regime itself." But life is hardly normal. Power is out most of the day. Fuel is in short supply. The school and burned-out homes now serve as shelters. More than 4,000 displaced Syrians moved here from other villages still under bombardment because Khirbet al-Joz is safe. The council office is a single room where a handful of men are in charge. Local government is mostly about handing out food. In one corner, there are bags of bread. This is a distribution center for an unruly crowd that has gathered in the courtyard outside. When the police finally arrive, the handouts begin. The policemen, in their new uniforms, are keeping order here. It's a very hard job. There are families pushing to get into the line to get the daily rations. There is produce in the local markets. A newly opened pharmacy is lightly stocked with medicines smuggled in from Turkey. But the displaced have no means to buy at any price. These donations come from the Turkish government. But they are not enough, says council member Abdul Wahad, because the aid is for 1,500 and there are more than 4,000 people to feed. Speaking in Arabic, Wahad explains that he was asked to join the council because he had experience in government. He switches to English to explain a sensitive and surprising detail of his past — that he was once a member of the secret police. He had a long career in the capital, he says, but saw an opportunity to defect when his home village was finally free and he and his family could be safe. Like so many Syrians, the 20-month revolt has changed his life. Now he sees his future here, in a small hillside border town that wants to set an example of a secular, democratic Syria but needs outside help for the experiment to survive.